Radiography – accessible and informative method of diagnostics of diseases of the bronchopulmonary system, accuracy reaches 80%. X-ray of the lungs allows to detect various pathologies in the early stages of development, which is especially valuable in Oncology practice. 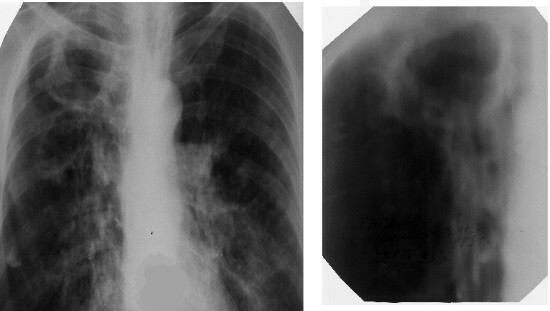 In addition, the chest radiograph may see changes in lung tissue, characteristic of tuberculosis process. In Russia practiced an annual preventive screening of all adult residents of the country. Healthy lungs look like on the picture? Pictures of the lungs in healthy and ill patients show the same structure: the lung fields on both sides of the spine, in the center of the shadow from the heart, in the upper part of the image visible clavicle and in the lower part of the dome of the diaphragm. On the pulmonary fields are projected the shadows of the ribs. The position of the lungs in the chest relative to other structures. The number of pulmonary lobes (normal 5). Form light (SAC-like cone with a sunken base and a rounded top). The size of the lungs. The contours of the lungs. A chest x-ray describe a healthy person in standard. First make data about the state of the lung fields, then describe the roots of the lungs, the diaphragmatic domes and the rib-diaphragmatic sinuses, then assess the condition of the heart shadow and soft tissues. The unified algorithm of the description of x-ray light is designed to reduce the probability of a random «skip» of pathological changes. Before the start of decoding pictures, the doctors pay attention to the patient’s age and gender. This is due to the fact that men have the chest muscles is usually developed stronger, and women have mammary glands which is able to impose features on the planar images of the chest. Patient age is important because in older people the likelihood of developing cancer is higher than the young. In the lung fields, there are no visible focal and infiltrative shadows. The roots of normal size, structural, not expanded. The contours of diaphragmatic-costal sinus and aperture without pathologies. Normal in the pictures of the dome of the diaphragm situated at the level of the sixth rib, while the right dome is slightly higher. In the center of the image, one can often see two or three thoracic vertebrae, spinous processes which in the normal lying between the clavicles equidistant from them. Also, the center needs to project the shadow of the trachea, heart shadow of normal should act right not more than 1 cm, and the left side of it should not go on the midclavicular line. The roots of the lungs is conventionally called the bronchial branching in lung tissue, normally they have a clear structure. They can be detected enlarged lymph nodes. Vascular pattern is not observed in the peripheral parts of the lungs. The rib-diaphragmatic sinuses should be free. READ MRI of the foot - what shows? 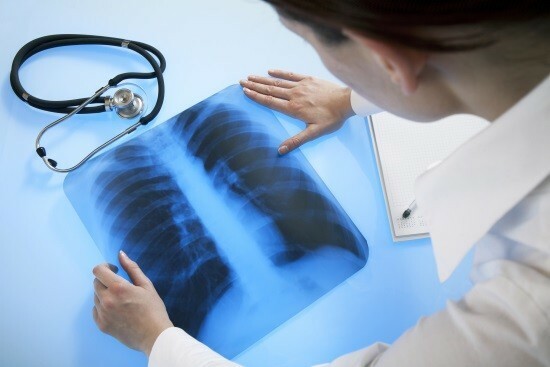 X-rays of healthy lungs and pathological conditions may vary between slight manifestations. For example, displacement of the trachea forward often indicates a pleural effusion or pneumothorax (air getting into the pleural cavity). Increased pulmonary pattern suggests inflammation, enlargement and displacement of the mediastinum – about the development of a bulk process. These and many other pathological changes can be noticed only by a qualified radiologist, to the ordinary person without special education to make it difficult. What should not be on an x-ray of healthy lungs? 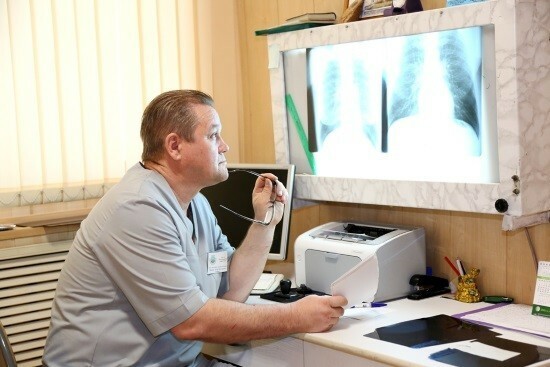 In Russia, every year preventive fluorography, the aim of which is early detection of tuberculosis and other pathological changes in the lungs. Various diseases can provoke the appearance of dark spots on x-rays. Areas of darkening can talk about the tuberculosis, pneumonia or malignant tumors, but sometimes these dark areas are caused by accumulation of dust in the lung tissue. Partial segments of the dimming characteristic of pneumonia, pleurisy, atelectasis, they affect only specific parts of the lung. Common throughout the lung field visible changes that often occur in polysegmental pneumonia, lung edema, exudative pleurisy, the genetic underdevelopment of the lungs. Limited to dark foci measuring up to 1.5 cm in diameter, are signs of a tumor or tuberculosis. Radiography provides an opportunity to obtain reliable information on the state of the bronchopulmonary system. The correct analysis of the images helps to diagnose many serious diseases at an early stage of development, thus preventing severe complications and unwanted effects.